Uncertainty plays a significant role in the Benchmark on the Aerodynamics of a Rectangular Cylinder (BARC) with a chord-to-depth ratio of 5. 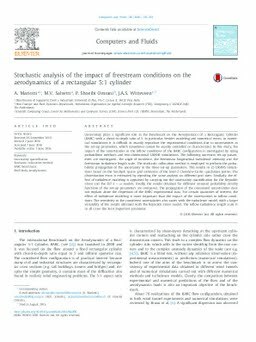 In particular, besides modeling and numerical errors, in numerical simulations it is difficult to exactly reproduce the experimental conditions due to uncertainties in the set-up parameters, which sometimes cannot be exactly controlled or characterized. In this study, the impact of the uncertainties in the inflow conditions of the BARC configuration is investigated by using probabilistic methods and two-dimensional URANS simulations. The following uncertain set-up parameters are investigated: the angle of incidence, the freestream longitudinal turbulence intensity and the freestream turbulence length scale. The stochastic collocation method is employed to perform the probabilistic propagation of the uncertainty in the three set-up parameters. This results in 25 URANS simulations based on the Smolyak sparse grid extension of the level-2 Clenshaw-Curtis quadrature points. The discretization error is estimated by repeating the same analysis on different grid sizes. Similarly, the effect of turbulence modeling is appraised by carrying out the uncertainty quantification for the Reynolds stress and the SST k-. ω models. Finally, the results obtained for different assumed probability density functions of the set-up parameters are compared. The propagation of the considered uncertainties does not explain alone the dispersion of the BARC experimental data. For certain quantities of interest, the effect of turbulence modeling is more important than the impact of the uncertainties in inflow conditions. The sensitivity to the considered uncertainties also varies with the turbulence model, with a larger variability of the results obtained with the Reynolds stress model. The inflow turbulence length scale is in all cases the least important parameter.